More than half of children either in foster care, or adopted from care in the developed world, have a measurable need for mental health services, while up to one quarter present with complex and severe trauma- and attachment-related psychological disorders. This book outlines how services can effectively detect, prevent, and treat mental health difficulties in this vulnerable population. 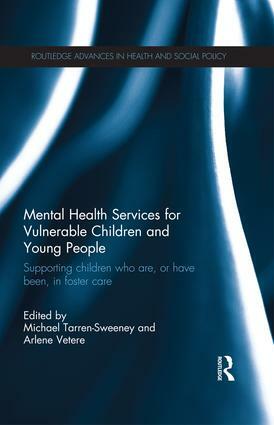 Responding to increasing evidence that standard child and adolescent mental health services are poorly matched to the mental health service needs of children and young people who have been in foster care, this book provides expert guidance on the design of specialised services. The first part provides an overview of these children’s mental health needs, their use of mental health services and what is known about the effectiveness of mental health interventions provided to them. The second part presents some recent innovations in mental health service delivery, concentrating on advances in clinical and developmental assessment and treatment. The final part confronts the challenges for delivering effective mental health services in this area. This is the definitive international reference for the design of specialised mental health services for children and young people in care and those adopted from care. It is invaluable reading for health and social care professionals working with this population and academics with an interest in child and adolescent mental health from a range of disciplines, including social work, nursing and psychology. Michael Tarren-Sweeney is a Clinical Psychologist, Epidemiologist and Child Developmental Theorist. He is Associate Professor of Child and Family Psychology at Canterbury University in New Zealand (where he teaches postgraduate psychology trainees through to board registration), as well as a Consultant Clinical Psychologist for government and charitable children’s agencies in Australia. Arlene Vetere is Professor of Clinical Psychology and Deputy Director of the PsychD in clinical psychology at Surrey University, UK. She is Professor of Family Therapy and Systemic Practice at Diakonhjemmet University College, Oslo, Norway. She is a UKCP Registered Systemic Psychotherapist and HCPC Registered Clinical Psychologist.